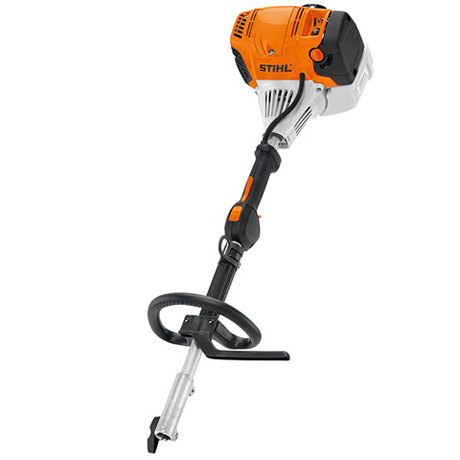 STIHL's successor to the KM 100 R.
With an updated 4-MIX engine, the KM 111 R is a powerful & efficient machine to work with. As well as all the key features of the previous iteration (the KM 100 R), this machine includes an improved version of the 4-MIX engine that runs on a fuel-oil mix like a 2-stroke, providing you with the benefits of four stroke power without the drawbacks. This engine gives fast acceleration, increased torque and high power, alongside less noise, lower emissions and improved fuel efficiency, so you can get your jobs done more quickly, more quietly and more easily than ever before. Fewer starting strokes are necessary with the KM 111 R, courtesy of its manual fuel pump, while less force is also required, due to a decompression valve. The auto-reset stop switch means the machine is ready to go again straight away, giving you less to think about while working. 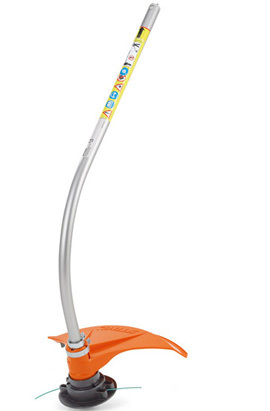 All of the important controls are grouped on the unit's multi-function handle, keeping everything in one place so you can reach them with one hand. 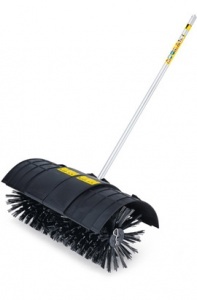 Operated with a comfortable loop-handle, the KM 111 R is perfect for areas with limited space, and tasks like thinning between bushes and shrubs. It enjoys compatibility with an impressive range of twelve attachments, including such diverse tools as a blower, brushcutter, hedge trimmer, pole pruner and bristle brush. These are all easy to fit with a quick-release coupling system. 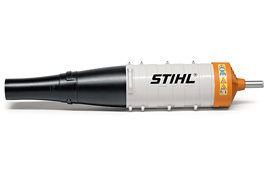 A bristle brush KombiTool attachment for STIHL's KombiSystem, which makes light work of dirty paths, patios and driveways. Suitable for all loop-handled KombiEngines (not for use with the FR 130 T). 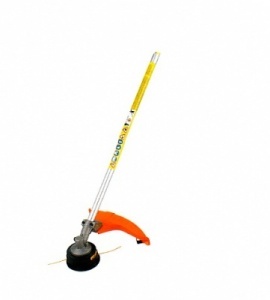 This KombiTool attachment converts your KombiSystem into a pole pruner with a total length of 126 cm, allowing you to effortlessly prune trees and shrubs. 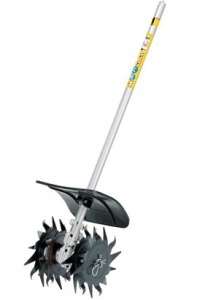 Suitable for all loop handle KombiEngines and the FR 130 T.
The perfect attachment for rejuvenating flower beds and plantings, and for mixing amendments like compost into the soil, the KM-BF Pick Tines attachment for the KombiTool system is approved for all KombiEngines and the FR 130 T.
This blower attachment transforms STIHL's KombiSystem into a fully-fledged high-performance blower. Easy to attach, it is approved for KombiEngines with loop handles. 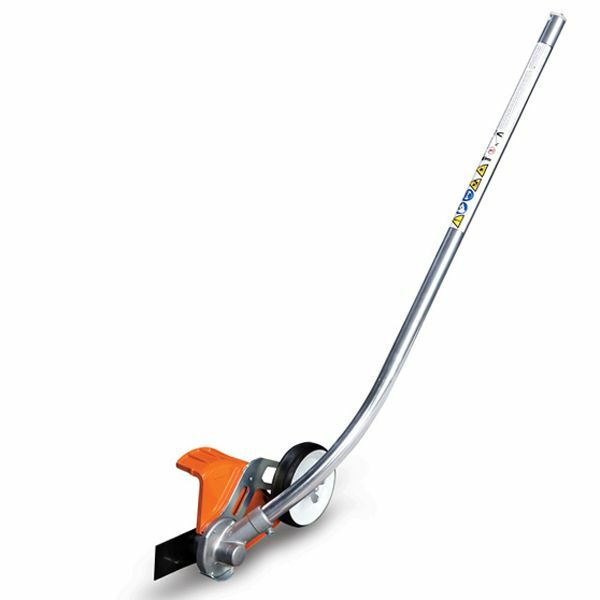 An AutoCut mowing head attachment for STIHL's KombiSystem, designed to clear grass along walls or fences, under hedges or along paths. 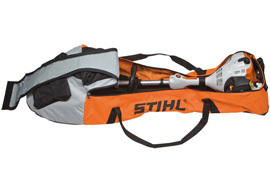 Approved for use with all STIHL KombiEngines. 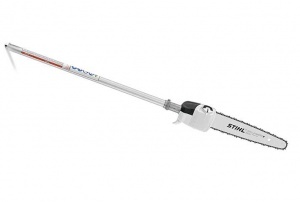 This is a metal grass cutting blade KombiTool accessory for STIHL's KombiSystem. Suitabled for use with all KombiEngines and the FR 130 T backpack brushcutter, is is idea for mowing heavy grass and weeds.